Nearly two weeks after the Macworld keynote which officially unveiled the 1.1.3 upgrade, O2 and the Carphone Warehouse’s stores are still selling iPhones with the older 1.1.2 firmware. 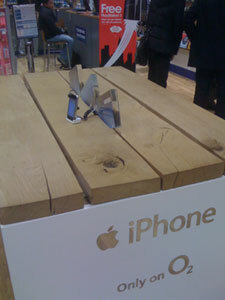 Of the four stores that I’ve tried in Swindon and Reading, all were selling iPhones that had not been upgraded. Of those, only one was planning to upgrade the iPhone – when they had time for it. Now I don’t expect them to be Steve Litchfield-quick when new firmware is released, but it leads me to wonder if there is any in-store firmware upgrade policy for O2 or Carphone – not just for the iPhone but for any smartphones? This is in marked contrast to Apple’s policy of resetting all their in-store devices at the end of the day, which provides a clean user experience and ensures that they are running the latest-and-greatest. To be fair, I think this is partly as a result of the different way in which the iPhone is sold. When you walk into a store, the iPhone is actually on and you can use it. With most other phones, even smartphones where the end-user is a little more likely to know of and want to try the advanced capabilities, you can usually only see a display model (although T-Mobile has a few devices available to try in-store). 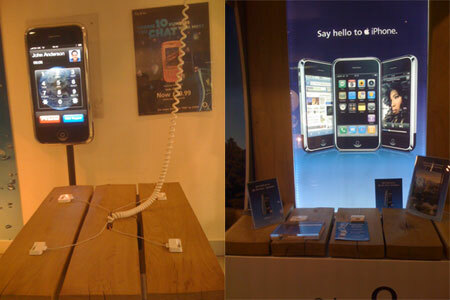 If you want to try a phone, a boxed model has to brought out and turned on. Additionally, other devices have operator-specific firmware, but this should only add a little to the upgrade workload in non-operator stores such as Carphone or Phones 4 U.
When’s the egg moment coming? I think it comes down to customer expectations. Most people never upgrade their phones and would look at you blankly if you said “firmware”. So stores are not encouraged to sell their customers phones with the newest software installed. With the iPhone on the other hand, they may well have seen adverts promoting Location on Google Maps, and expect that on the in-store device. This is a prime opportunity for an egg moment. As Marek Pawlowski describes it, it’s a small investment in the customer experience that pre-empts a more serious customer failing. In this case the serious failing is not buying the device. With a little investment in getting the iPhone updated, then you continually have new wow factors to push it to customers. There’s hardly an iPhone in sight! They’re not putting iPhones on display as they’re worried they will be stolen. After I left these stores I though, “With friends like these…”. Perhaps it’s not the pricing Apple should be concerned about after all, but rather getting their retail partners to provide the same high level of customer experience. This has always been Apple’s problem… think about how incredibly poor the display of Mac equipment has been at PC World over the years. Honestly, I’ve been disgusted… MacBooks with keys broken off, Mac minis with the no monitor or no mouse are just a few of the travesties! No wonder they started their own chain of stores. I can see the current arrangement with PC World coming to an end, to be honest. I think it will either be replaced with a “store within a store”, as with the US deal with Best Buy, or it will just end. Actually, the Poole PC World has exactly that, a store within a store, started about 3 months ago, it’s not perfect, but it’s much improved.